Naxos is the largest island (430 Km² - 167sq miles) of the Cyclades island complex. It was the center of archaic Cycladic culture. The island is divided into two municipalities: Naxos and Drymalia. The largest town and capital of the island is Naxos city, also called Hora, with 6,530 inhabitants (2001). The main villages are Filoti, Apiranthos, Vivlos, Agios Arsenios, Koronos and Glinado. Most of the over 60 villages on Naxos are mountainous. 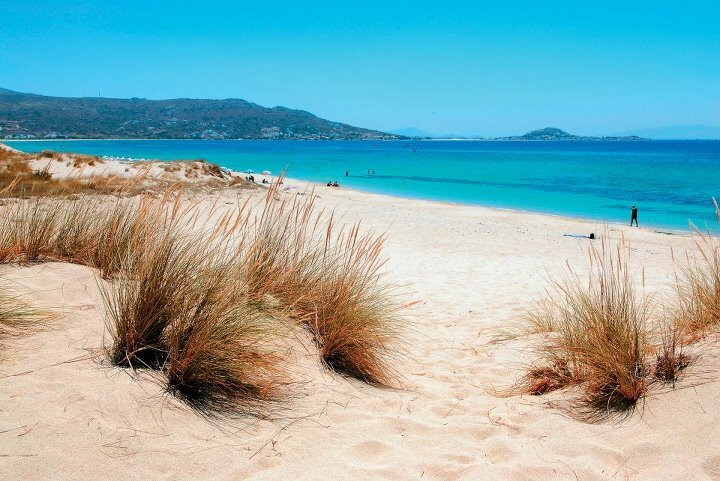 Naxos has many beautiful beaches, such as those at Agia Anna, Agios Prokopios, Kastraki, Mikri Vigla and Agios Georgios. Naxos is the most fertile island of the Cyclades. It has a good supply of water in a region where water is usually inadequate. Interesting information concerning Naxos you can find through the Greek Travel Pages (GTP) and Wikipedia. There are plenty of Taxis and a fairly good bus network. Bus (KTEL) depot location: At the end of the pier at the port. Ferry connections and schedules for domestic routes, like Naxos, are usually announced by most shipping companies, a couple of weeks before the beginning of each season. There are some exceptions though, like Blue Star ferries, which announces schedules in the beginning of the year. Morning: Daily at least 2 conventional ferries and 1 Hydrofoil. Afternoon: Daily both Hydrofoil and conventional ferries. Information concerning Athens ports serving routes to Naxos you can find further down. Note: Not all above connections operate throughout out the year.